Miss Addams was asked to sum up the discussion. 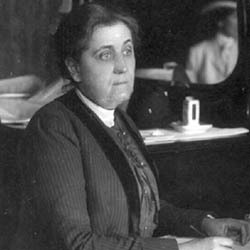 MISS JANE ADDAMS, Hull House, Chicago.-– The meeting has been going so steadily in one direction that there seems to be no necessity for summing up the argument. However, Georgia has not yet secured a child labor law, and it may be useful to give you some of the arguments which come up in every state when the child labor law is under discussion, and some of the replies to these arguments which have served in Illinois. One which we constantly met we learned to call the "self made man" argument. 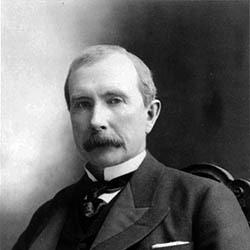 We were told a hundred times,--I am going to be moderate-–that Mr. Rockefeller and all the other successful men went to work when they were twelve years old, that all the merchants and manufacturers secured their business start when they were babies. In all this absolutely no account was taken of the changes in industrial and commercial life which have taken place during the last thirty years. A successful merchant told me exactly what he did when he was twelve years old, and I found that he went to the country store very early in the morning, that he took down the shutters and swept the floor, that during the day he waited on customers, most of whom he knew personally, that part of the day he delivered the packages and stopped a moment for a friendly [cookie] or ginger snap; that later he kept the books and accounts; that his employer sometimes took him with him when he went to a larger city to buy goods. In short, he had an almost ideal opportunity for learning the business methods of a rising merchant in a country town, just the sort of education the business schools are trying to reproduce. When I asked him how nearly that corresponded to the training boys were getting in his own store, he admitted that the boys who carried cash from early in the morning until late at night had little sense of relation to the business and no real identification with its wider interests. The whole thing was as unlike his experience as two childish experiences could be-–one varied and educational, the other monotonous and deadening. 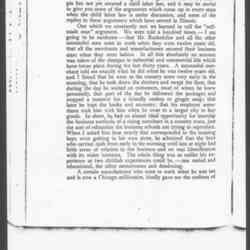 A certain manufacturer who went to work when he was ten and is now a Chicago millionaire, kindly gave me the outlines [page 2] of his boyish experience. He began as a miner, and learned the various manufacturing processes, from the handling of the crude ore to the finished product, in quite the same way as the most advanced schools are reproducing in miniature, an experience incomparably more valuable than that of a boy tending a machine in his big factory. Indeed, nothing is more fallacious than an argument based upon personal experiences of thirty years ago. I always feel like saying to these men, "You show the weakness of the self-made man, when your sole standard is that of personal experience, and you find it impossible to use any other form, even when the basis for that experience is totally changed." Another argument is the "idleness argument." We were constantly asked whether we would advocate idleness for a child. Certainly no one who is in touch with the new education could for a moment stand for idleness, but we advocate not only work, but work which has an educational value. We claim that there is no educational value in the subdivided labor of most factories. A child who remains year after year in a spinning room gets no education nor incentive to work, but almost surely acquires a distaste for all labor. 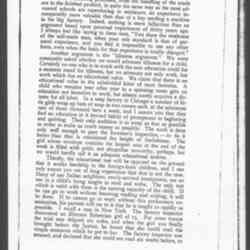 In a soap factory in Chicago a number of little girls wrap up bars of soap in two covers each, at the minimum rate of three thousand bars a week, and I assure you that they find no education in it beyond habits of promptness in beginning and quitting. Their only ambition is to wrap as fast as possible in order to make as much money as possible. The work is done only well enough to pass the foreman's inspection-–to do it better than that is considered the height of foolishness. The girl whose envelope contains the largest sum at the end of the week is filled with pride, not altogether unworthy, perhaps, but we would hardly call it an adequate educational motive. 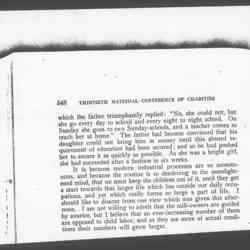 Thirdly, the educational test will be opposed on the ground that it works hardship to the foreign-born children, and I can only assure you out of long experience that that is not the case. Many of our Italian neighbors, newly-arrived immigrants, see no use in a child's being taught to read and write. The only test which is valid with them is the earning capacity of the child. If he can go to work without knowing reading and writing, it will be done. If he cannot go to work without this preliminary examination, his parents will see to it that he taught as rapidly as possible. I recall a case in New York. The factory inspector discovered an illiterate Bohemian girl of 15. For some reason the trial was delayed six weeks, and when the girl was finally brought before the Justice, he found that she could read the simple sentences which he put to her. 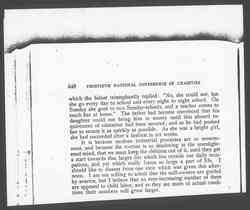 The factory inspector was amazed, and declared that she could not read six weeks before, to [page 3] which the father triumphantly replied: "No, she could not, but she go every day to school and every night to night school. 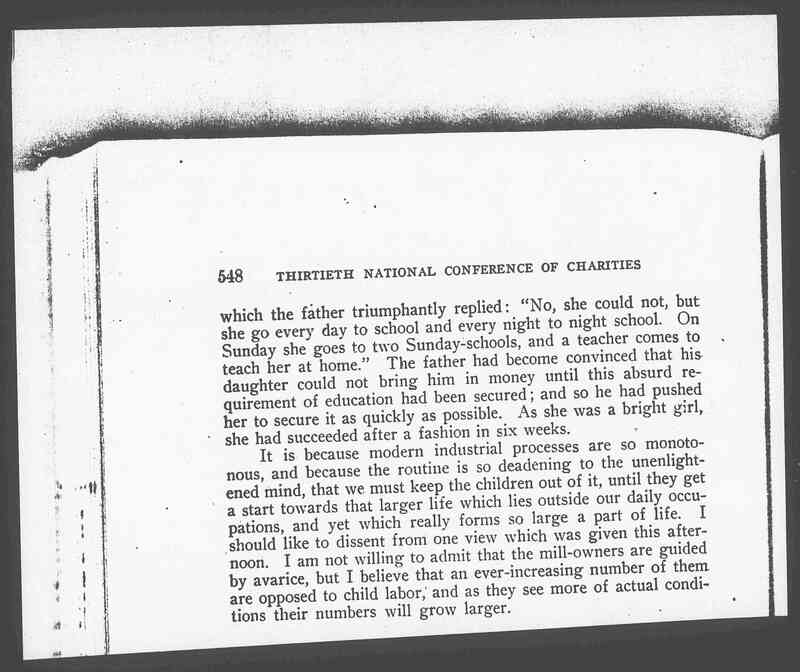 On Sunday she goes to two Sunday-schools, and a teacher comes to teach her at home." The father had become convinced that his daughter could not bring him in money until this absurd requirement of education had been secured; and so he had pushed her to secure it as quickly as possible. As she was a bright girl, she had succeeded after a fashion in six weeks. It is because modern industrial processes are so monotonous, and because the routine is so deadening to the unenlightened mind, that we must keep the children out of it, until they get a start towards that larger life which lies outside our daily occupations, and yet which really forms so large a part of life. I should like to dissent from one view which was given this afternoon. I am not willing to admit that the mill-owners are guided by avarice, but I believe that an ever-increasing number of them are opposed to child labor, and as they see more of actual conditions their numbers will grow larger. 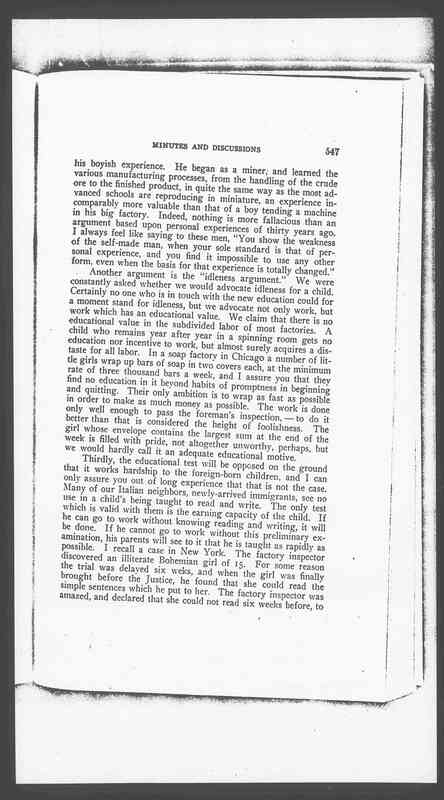 Addams comments about child labor, pointing out the difference between the educational opportunities child workers had a generation ago versus those working in factories in 1903. 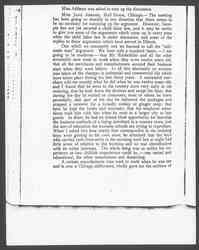 National Conference of Charities and Correction, Proceedings (1903): 546-48. 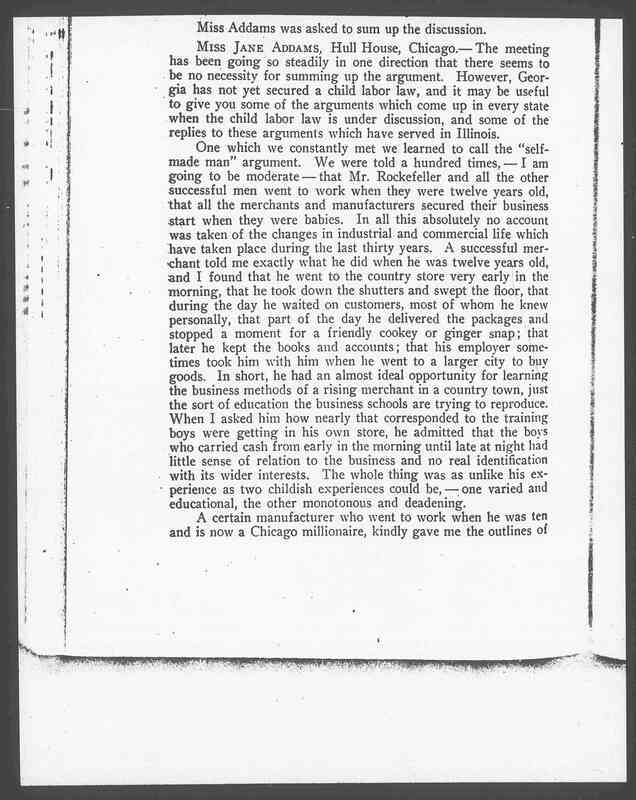 Addams, Jane, “Summary of Discussion on Child Labor at the National Conference of Charities and Correction, May 11, 1903,” Jane Addams Digital Edition, accessed April 18, 2019, https://digital.janeaddams.ramapo.edu/items/show/1186.